The Eurozone Is In Recession, But Where Do We Go From Here? Well, it's official, or at least its as near official as it's going to get at this point: the Eurozone is in its first recession. And how do I know this? Well Frankfurt-based Financial Times European economy correspondent Ralph Atkins told me it was, in this article last Tuesday. Joking aside, this line-judge ruling (we will remember the eurozone doesn't have an official referee with the authority to call recessions like the US NBER) from Ralph is significant, both due to the fact that he is about as plugged-in as it is possible to get - without, that is, electrocuting yourself on all that high voltage cable knocking about over there - to mainsteam ECB thinking over on Kaiserstrasse, and also because he has been one of the most stalwart journalistic defenders of the idea that the German economy was finally - after many years of sub-par growth - "recovering", and indeed was now, finally, in a position to take front spot on the bright and sparkling High Speed Train which was going to pull all that recently "decoupled" European growth out of the station sidings where it had been parked for so many years. Unfortunately none of this was ever really to be, and I think that behind Ralph now folding his position lies another, and much more troubling unfolding, that of a highly export-dependent German economy (as forecast by me, on this blog back in July) in the face of a steady slowdown in all its main customers, one after another. Signs of the times, Johnny, signs of the times. Really the straw which broke the camel's back in this particular cave-in was the latest round of flash eurozone PMI readings. The composite index –which covers services as well as manufacturing – fell from 48.2 in August to 47 this month. Since any reading below 50 indicates contraction it is clear that the rate of contraction accelerated in September, and indeed as Frank Atkins himself points out, this was the steepest contraction rate since the aftermath of the September 11th bombings, and indeed represented the fourth consecutive month in which the index has found itself in contraction territory (and, of course, three of these months actually constitute Q3 2008). 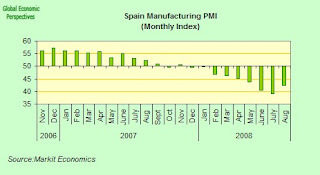 And it isn't just the composite index that is showing contraction - both the services and manufacturing components are contracting, with the manufacturing index registering the steepest contraction rate, with a 45.3 reading this month, meaning that the backward march of European industry has gathered speed from the 47.6 August pace. In the meantime European services decline at a more senyorial pace - with the index only dropping to 48.2 from 48.5. At this point we only have detailed estimates for two of the big four - Germany and France - but it isn't that hard to guess what has been happening in Spain and Italy. 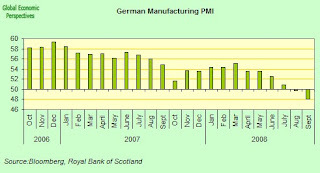 Really the most important single piece of information I think we have on the table is the fact that Germany's manufacturing sector contracted for a second straight month, with the index falling to 48.1 in September from 49.7 in August - this is the weakest showing from German manufacturing since July 2003. Even more preoccupying was the fact that the reading for the volume of new export orders was particularly weak, with the sub component showing the lowest level for eight years. 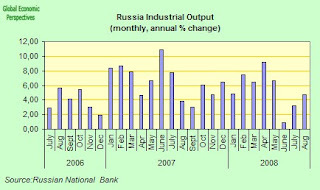 This seems to indicate that we can expect the sector to weaken further in the months to come, and really the explanation for this sudden deterioration in German exports is not that hard to find, it lies in the financial aftermath to all those Russian tanks rushing through the Roki tunnel into South Ossetia recently, as I explain briefly in this post here (more on this below). 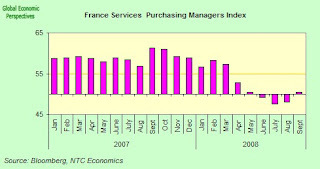 The only bright spot was that French services did expand slightly in September it seems, rising to 50.4 from 48.0 in August. On the other hand, business confidence continues to decline right across the big four, which simply reinforces my point about not being too eager to translate rising consumer confidence (however long it may last or not last) through to end sales for companies. 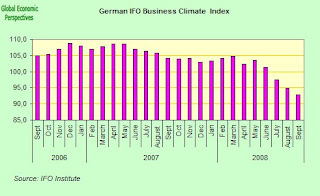 In fact German business confidence declined to its lowest level since May 2005 in September according to the Munich-based Ifo institute's business climate index, which fell to 92.9 from 94.8 in August. As can be seen in the chart, it isn't exactly falling off a cliff, but it ain't far off. Well, as Frank Atkins suggests, a technical recession across the eurozone in quarters 2 and 3 would seem now to be more or less a done deal (that is, we could say that the eurozone recession technically started on 1 April 2008), and the real front-end-of-the-curve argument is, how long will it last? Now according to received wisdom (you know, the Bible as written on Kaiserstrasse and handed down - or perhaps read out at post rate-setting press conferences - to us mere mortals), growth should start to bounce back in the last quarter, and then a full recovery should begin in early 2009. But remember, this argument was brought to you by those who a mere three months ago were busy saying that the German economy was looking as safe as houses (although not, I should hasten to add, US houses, or Spanish ones for that matter) and looking at what has been happening in global financial markets over the last two or three weeks, I have to ask myself whether there is anyone left who can still recite this version of the authorsied psalter and manage to keep a straight face? It could be that the zone as a collective entity will expand slightly quarter on quarter in the last three months of the year, I think it is far to early to start speculating on this, but what I do think we can say with almost categorical firmness is that growth in all of the big four eurozone economies is likely to remain weak throughout 2009 (and by weak I mean moving up and down around the zero percent mark, although in the Spanish case I think I would go so far as to say that it is quite unlikely that the economy will break zero in any of the four quarters), and that is really as far ahead as I am willing to speculate at this point. That is we may well see a pattern where one quarter of weak expansion is followed by another of weak contraction, as we have been growing accustomed to seeing in the Italian case since mid 2007. In a sense this is what a credit crunch plus excessive inflation means, and the only question is at what level the "barème" should be set. What I really do seem to be unable to find at this stage are any compelling reasons for thinking that we should anticipate any kind of rapid rebound, indeed it is far easier to think of reasons why we shouldn't. Three key factors come immediately to mind in this context: the price of oil, the relative value of euro-dollar, and the availability of credit. The first of these three hits consumers directly (and producers indirectly since it becomes that much more difficult to sell), the second (a high euro, which we should expect to some extent to be the by-product of the continuing weakness in the US economy, although exactly where euro-USD will settle is one of the greatest incognitas of the current conjuncture ) hits export-dependent economies hardest (Italy and Germany come immediately to mind, but now arguably Spain has now become an export dependent economy, at least for the duration of its structural move away from construction dependence), while the third (credit availability) will affect the real economy as a whole, by restricting the ability of consumers and corporates alike to borrow, and thus finance acquisitions of one kind or another. Really each of these three merit an article in their own right. In comparison the fourth wild card - interest rate policy at the ECB - seems like rather small beer at the end of the day, and indeed the ability of the ECB to sustain (say) Spain's troubled banking system may constitute a far more important contribution from the bank at this point than a few quarter point reductions in the repo rate, at least in the short term. Of course, it is just this ability to continue to keep the Spanish banks afloat in the mid-term which constitutes another of the big eurozone forward-looking enigmas. One of the biggest obstacles to getting to grips with the economic issues facing the individual member economies of the eurozone is quite simply the inherent tendency to lump what are effectively apples and pears all together in one and the same basket. As as result we tend to hear very little (for example) about specific policy measures designed to handle the almost unique problems now facing the Spanish economy. Hence it is difficult for journalistic observers to understand just why it is that the Spanish banks most definitely do need some kind of special treatment (and indeed far more than they have been getting) from the ECB, or - to take another tack - why the terms of the Stability and Growth Pact Mark II (3% annual deficit limit, 60% debt to GDP maximum), should not be simply applied in blanket fashion, and why France may with some legitimacy say that the 2011 balanced budget target is not as urgent and pressing a matter for them as it is, say, for Italy, and indeed why it may be in the collective interest of the entire zone to go easy on France (and indeed Spain) in this context (more below). But as I say, what we have here are apples and pears, and what we badly need is some sort of consensus typology of the individual national economies, on the basis of which effective policy could be developed. In each of the big four cases the problem is different, and the sooner we wake up to this the better. The Italian situation is really most preoccupying, since output seems to have hit some sort of ceiling or other. As I suggest in this post, retail sales may well now have passed their historic peak as the problem of population ageing starts to get a hold, while, as Ugo Bardi points out in this post here, if oil stays over $100 in the longer run, then expansion may well become a thing of the past for Italian industry. Given that - with a debt to GDP level of around 105% - the Italian government now has to systematically reduce spending or risk credit downgrades with all that that would entail in the present climate, then quite simply it is hard to see where any growth at all is going to come from for the Italian economy in the years ahead. As we can see in the chart below, Italian GDP growth has been in trend decline for some time now, and certainly at this point trend growth cannot be much outside the 0% to 0.5% range (and it may even have turned negative in the eventually that oil stay high). 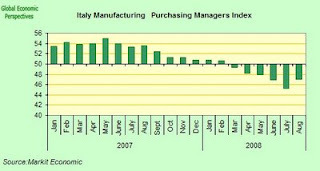 As can be seen in the chart, growth in the Italian economy has now lagged well below the eurozone average for more than a decade and growth is surely set to be the slowest in the euro region this year, even according to the latest European Commission forecast of a positive 0.1% issued on Sept. 10. The Italian employers group Confindustria - whose forecasts have been far and away the most realistic all this year - last week suggested the Italian economy would actually have a whole year contraction of 0.1 percent in 2008. If the prognosis is realised this will be the first annual contraction in the Italian economy in 15 years, and only the third annual recession since WWII (the others were in 1975 and 1993). In fact this is even worse than I was (I thought) pessimistically predicting at the start of this year (see my posts on my Italy blog), and in fact the outlook for next year would seem to be worse not better. The Italian government has also cut its 2008 economic-growth forecast this week, but they continue to cling on to the hope that the economy may expand, however slightly, revising their outlook to a 0.1 percent increase this year, down from the 0.5 percent predicted on June 24. The latest forecast was made public in just the same moment as Finance Minister Giulio Tremonti prepared to announce government spending for the proposed 2009 budget (which was submitted this week to the Italian Parliament for approval). Tremonti's three-year spending proposal, which represents an attempt to maintain the objective of balancing the budget by 2011, incorporates 10.4 billion euros ($15.3 billion) in cost cuts and savings for 2009. These saving rise to 17.2 billion euros in 2010 and 31.2 billion euros in 2011 in the hope that Italy will be able to balance the budget by that year. Tremonti has indicated that Italy's fiscal deficit will deteriorate slightly to 2.5 percent of GDP this year from 1.9 percent last year, but has asserted that in 2009, the budget shortfall will drop to 2.1 percent (although this is based on a government forecast of 0.5% GDP growth in 2009 which may well not be achieved). Clearly this attempt to stay on course for a reduction in the level of Italian government debt is a laudable objective given the risk that any slippage will result in downgrading of Italian sovereign debt by the rating agencies, but it will be a very hard medicine for Italian citizens to swallow, since it will mean that the fiscal stance will be biased towards contraction at just the time when global credit conditions may remain tight and oil may stay over $100 in the mid term, in which case it is hard to see how negative growth in 2008 will not be followed by more of the same in 2009, and ditto in 2010. This at least is the big risk as I see it. This is what it means to be totally export dependent, your headline GDP growth simply is very sensitive to any sudden sharp move in the rate of export growth. This is why most observers have been surprised by the severity of the German downswing, since they have simply not factored-in congenital export dependence (which is related to the age structure of the German population as far as I am concerned). 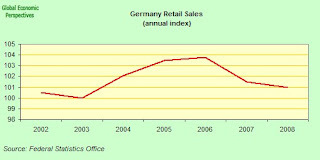 For similar high median-age-related reasons German retail sales also seem to have peaked, in the German case in 2006 (see chart below) while the representatives of the construction industry have looked more like a set of dead men walking (or should I say following Eugen Leviné, dead men on leave) since the bursting of the last construction boom in 1995 . (I think a nice exam question for a 101 course in neo classical economics might be: the German and Spanish economies have had the same monetary policy applied since 2000, with differing outcomes for the respective housing sectors, explain). As I said above, the final nail in the coffin for the most recent German expansion seems to have been hammered home by those Russian tanks going full throttle though the Roki tunnel, since Russia was really one of the last remaining areas of export expansion for German industry after all the others had steadily fallen down one by one (parodying Oscar Wilde, losing one of your customers might be thought to have been an accident, but losing all of them, one after another....). The big risk, as far as I can see is not simply that Russia ceases to be such an important source of German export demand, but that the slowdown in Russia also impacts on other countries who are close trading partners with Russia, such as the other economies in central and eastern Europe. Should this happen, and there are already signs that it is, then the impact will basically be a second shoe to drop for Germany, via the indirect route, since these countries are also important customers for German exports in their own right (especially the Czech Republic, Poland and Hungary). German exports to Russia were up by 23 per cent in the first half of 2008 to €15.8bn ($22.5bn), according to the latest data from the German Federal Statistics Office. To put this in perspective, this is roughly 45% of the €36.8 billion euros worth of goods sent to the USA over the same period. 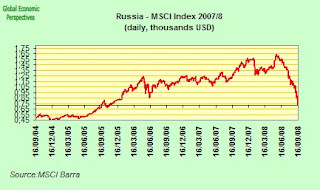 It is not so much the volume as the rate of increase or decrease that matters, so while exports to the UK dropped 1.5% in H1 2008, while to the eurozone they were only up 3.9%, these Russian purchases were giving the much needed life blood to German industry. As always Spain's case differs from the other members of the "big four". Long the star pupil of the monetary policy classes being offered over in Frankfurt, Spain's stellar growth has now all of a sudden been transformed into its opposite. I have already gone into the background to all of this in two extensive posts on this site (here and here), so I will not burden you, dear reader, with more paraphenalia, beyond saying that Spain appears to be suffering from a systemic banking and financial structure crisis, and that the slowdown in the construction sector and the increase in unemployment is simply a surface reflection of this. This problem needs urgent attention (indeed it is possibly the most urgent item in the ECB in tray at the present time), but for our present purposes what matters is that the eurozone can in no way count on a growth contribution from Spain in 2009, in fact quite the contrary, we are more than likely going to see a Spanish GDP annual contraction, and possibly a quite substantial one. Well, while the Spanish economy has long been the ECBs leading pupil, and the Italian one has been more like "l'enfant terrible", France has distinguished itself over the years by being, quite simply, extraordinarily ordinary. 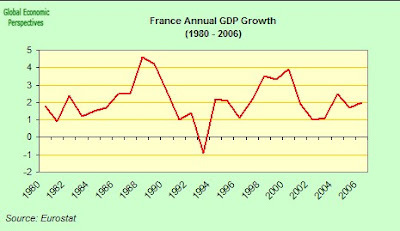 French GDP growth has excelled neither on the upside, nor on the downside in recent years, and in that sense France may be thought of as constituting something of a pole of potential stability during the current downturn (if Sarkozy and Trichet can put the knives away that is, and settle their differences in traditional gentlemanly fashion). To be sure, the French economy needs structural reform, and the French system of public finances does need a huge overhaul, but, if we are more pragmatic than ideological, the fact that France is not under the same structural and demographic pressures to balance its budget by 2011, and the fact that France is running something of a trade deficit at a time when the other three big four economies badly need to export cannot be such a bad thing. Indeed French President Nicolas Sarkozy's announcement today that he intends to shelve for the time being the deficit-reduction objective in the 2009 budget can be read as a move in that direction. The French budget is based on an economic growth forecast for this year and next of 1 percent, less than half the 2007 pace, and this seems fairly realistic, but it will leave France with less revenue and higher welfare costs than previously anticipated. Sarkozy intends to keep the budget shortfall at 2.7 percent of gross domestic product this year and next, which means that the French government won't be able to balance the budget in 2012, as previously pledged (France had already indicated a delay of one year over the norm). And all I can say is, more power to his elbow, since as I indicated above, I don't see this kind of decision as especially problematic, as long that is as the structural changes which are so necessary to guarantee sustainability in the longer term are implemented at the same time. Well in this post I have attempted to argue a number of things. Firstly, the eurozone is now, in all likelihood, in its first recession. The bride can no longer wear white. But this had to happen one day or another, so it isn't exactly the end of the world. What we do now need to do though is face up to the reality of what is happening, and work to devise the policies which will help move our economies forward. I am also arguing that this goal requires a recognition of that other reality, the de facto one of the existence of varying typologies across each of the individual big four eurozone economies, together with an acceptance of the inherent strength and weaknesses of each and every one of them, and the abandonment of the idea that they are all converging towards one common "ideal type", which they clearly aren't, except perhaps in that famous longer of longest terms mentioned by Keynes. This recognition should open the door to the possibility of a rather more flexible policy, giving support where support is needed and not demanding uniformity simply for the sake of uniformity. Of course, I have long found myself being accused of being an idealist, and perhaps the vain hope that we could react flexibly and pragmatically to our common problems is just one more example of my "rotten to the core" idealism. Maybe it is, but I certainly hope not. Slovenia - Are Things Really As Good As They Look? This post to accompany Manuel's coverage of this weekend's parliamentary elections focuses on one or two key issues - excessive inflation and the construction boom, and what to do about the problematic combination of the two. A much fuller examination of the main structural issues facing Slovenia's economy can be found in my Slovenia is Different post, written at the time of last October's presidential election. Although inflation has been at times the highest in the Euro zone - Slovenia adopted the Euro as its currency in 2007 - the country's economy has otherwise performed well under Janša's tenure, registering solid growth, the lowest unemployment rate since independence and - according to government statistics (but not those of the EU or the IMF) - a budget surplus. This paragraph seems, more or less, to sum up the current "received wisdom" on Slovenia, namely that the economy is preforming well, even if the level of inflation is a bit of a nuisance, and needs to be brought down. But how accurate is this picture? And is there more than meets to eye to be worrying about here? These are the questions I would briefly like to ask, even though, I hasten to add, this is not in any way an attempt to question Janez Janša's stewardship of Slovenian society - this is evidently beyond my expertise - although even as I write these words the polling stations are now safely and well-and-truly closed in any event, so I could hardly, even inadvertently, harm his reputation, even if that were my intent, which it is not. Well, to start at the beginning, it is evidently the case that Slovenia's economy has been growing very strongly in recent years, averaging just over 5% growth a year between 2004 and 2007, and indeed this has been more or less exactly the rate in the first two quarters of 2008 (Q1 5.4%, Q2 5.5%). It is also the case that unemployment has fallen to quite low levels. The unemployment rate has fallen from 6.9% at the end of 2005 to 4.2% in August 2008. Obviously the number of unemployed has fallen commensurately, from 71,000 at the end of 2005 to 45,000 in August 2008. But while this drop in unemployemnt is evidently to be welcomed, we need to ask ourselves a standard economic question: just how far can unemployemnt fall without causing excessive supply side capacity constrants, and producing overheating and the excess inflation which goes with it? Well, looking at the differential between Slovenia's inflation and that of other members of the eurozone it seems that point has long since been passed, since eurozone inflation is running around the 4% mark (and even that is far too high for the ECB), while Slovenia's inflation was running at a 6% annual rate in August, and this was down from a 6.9% one in July. Now, I know, I know, we have been living through a period of excessively high food and energy prices, and Slovenia has been struggling to handle the price shock, but the other 14 members of the eurozone group have experienced similar price shocks, yet inflation is in EVERY case lower, so this is not, alone, a sufficient explanation. Now I raise all of this, since there are two things we need to bear in mind in the Slovenia case. The first of these is the special demographic profile of the East European countries, and the way in which many years of below replacement fertility, and the consequent problem of growing labour shortages in the longer term, have placed definite limits on the rate of inflation-free stellar "catch up growth" that you can run your economy at and beyond which you start to accelerate price increases far beyond the sort of "comfort zone" which the local administration should be happy with. The second point is, of course, that membership of the eurozone is not simply a "pure good in itself", it has its upsides and its downsides, and the downsides need very careful attention paying to them, since if don't pay them the necessary attention in time then you run the very real and significant risk of creating very large problems which you will need to resolve later - as the citizens of Spain and Ireland are now unfortunately discovering to their costs. The biggest downside to eurozone membership is that you lose the possibility of running an independent (tailor made) monetary policy, and this creates the problem of possibly having to learn to live with the reality of strongly negative interest rates during an extended cyclical upswing (which is what is happening to Slovenia now, with prices increases of over 6% and ECB interest rates at 4.25% - and possibly about to come down). So this situation needs a policy response, and in my opinion, adequate policy responses were not devised before the euro was put in place (again, as the sorry current reality of the Spanish and Irish economies shows only too clearly, growth is good, but if the growth comes in the form of a "boom-bust", then perhaps you would have been better off without that "extra mile" of growth in the first place). Basically membership of the eurozone has two consequences for a society with the kind of inbuilt high inflation expectations that Slovenia now seems to have, interest becomes far too cheap for the real expansionary needs of the economy, while membership of the eurosystem (with an ECB that is prepared to accept all kinds of paper securities in exchange for bank funding) seems to offer an "investment grade" kind of feel for all kinds of inherently rather risky financial practices, like, for example, the issuing and purchase of residential mortgage backed securities. The net upshot of all of this, is that what you get is a level of construction activity which is significantly above the soberly evaluated desireable one. Perhaps a couple of years ago this point was rather harder to argue, but in the light of what has happened in the US over the last weekend, I hope it may now seem a little bit more "self evident". So the danger signals we should be watching out for are threefold: a significant uptick in inflation, above the eurozone average, a notable uptick in construction activity, and a notable rise in the rate of new mortgage lending to households. Unfortunately in Slovenia we can now see all three. Not that the process has developed - in true Spanish style - a lo grande, but the overheating is there, and if the situation is not reined-in now then the problems are going to accumulate. We have seen the inflation indicator, now let's look at construction output. As we can see in the chart below, at the start of 2006 the construction share in Slovenian GDP started to tick up, from the long term historic average of about 4.5% of GDP to its present rate of just over 6%. As I say, at this point this increase is modest, and bringing it back down a touch will not be too painful - we are a far cry at this stage from the 11% of GDP which was to be found in Ireland and Spain before the bubble burst, and in the present financial climate lenders are unlikely to allow Slovenia to reach these levels, but the problem does need to be addressed. And mortgage lending to households, which again is not especially high in absolute terms, has been rising rapidly recently, and is now up around 50% from the level in January 2006 (or in a mere 18 months - see chart below). It is the rate of increase rather than the volume I think that matters here, since it misallocates resources from one sector to another, and distorts prices, and then all of these distortions need to be corrected. 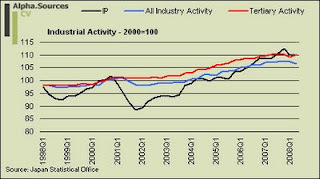 And Speaking of distortions, why don't we have a look at what is happening to Slovenian industry while the construction sector is booming. As we can see in the comparative chart (below) Slovenian industry is suffocating, While GDP was growing at something over 5%, during the first seven months of this year industrial output grew (yoy) at something like a 1.3% rate, while construction activity grew at a rate of 19.44%. So the weaight of manufacturing industry in the Slovenian economy is reducing at just the time when we learn from the United States that the consumer borrowing, financial services and construction driven model for an economy has some basic flaws in it. 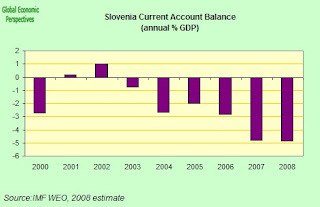 Slovenia, as is well known, runs a goods trade deficit, if inflation continues at the current above-eurozone-average rates for any length of time, then the accumulated drop in competitiveness will only eventually give Slovenia similar problems to those already being faced by Italy and Portugal. And at the same time Slovenia has developed a current account deficit, which again is another important warning indicator. Well basically the best thing to do here is not to sit back and wait for the problems to happen. Since you have no independent monetary policy you can't use interest rate policy direct, but the Bank of Slovenia does have the regulatory role of supervising credit activities and they can - if they want to - really twist the local banks arms to make the credit conditions tighter (like enforcing lower loan to value rates, lower multiples of earnings, more detailed documentation in support of loans, etc). 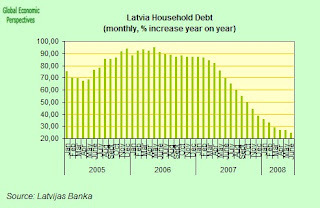 In case any of you are sceptical that this type of approach would have any impact the following chart shows what happened to household lending growth in Latvia after conditions were tightened in April 2007 (Latvia also has no independent monetary policy, since the Lat is pegged to the euro). 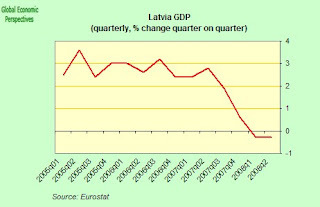 As we can see lending simply went for a nose dive, and the Latvian economy went hurtling off into a hard landing. Of course, lending was growing at a lunatically high rate (around 90% yoy) at the height of the boom, so the fall was equally dramatic. Fortunately Slovenia's problem is of a much smaller order, and the correction can be of the "soft landing" variety, but remedial action does need to be taken. "The general government deficit narrowed to 0.1 % of GDP in 2007 after1.2% in 2006. 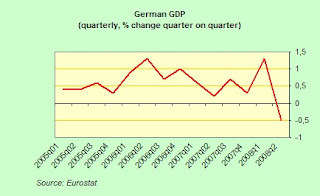 This outurn was below the 0.6 % deficit anticipated inthe November 2007 stability programme. The general government deficitis expected to increase to 0.6% of GDP in 2008." So really we should learn two lessons here. The first that economic data is not of the kind which is most favoured by the positivists, since it is most definitely fluid rather than hard, and constantly being changed for a whole variety of reasons, and the second is that politicians are far more likely to call press conferences and make "historic" declarations when the news is good, than they are to hold them for a subsequent (slightly) negative downard data revision. The headlines don't look quite the same, now do they? But leaving all this aside, what Slovenia needs to take some of the heat out of domestic demand and the construction boom is not a fiscal surplus of 0.1% of GDP, but rather something more to the tune of 2-3% of GDP. If you can't slow demand growth down using interest rates, then you surely can by attacking the problem directly and running a fiscal surplus. And there is another reason why Slovenia would do well to be rather more ambitious on the fiscal surplus side at the present time, and this relates to the structural pressures on the Slovenian budget: as the IMF pointed out in its most recent staff report, Slovenia is now one of the most rapidly ageing European societies (see median age chart at foot of the post), and accumulating resources now in the good times would seem to be the prudent way to go about things. For Slovenia, the main challenge to debt sustainability arise from age-related spending pressures. With one of the fastest aging populations in Europe, and a generous pension system, Slovenia’s debt is expected to rise rapidly after 2020 undermining its long run fiscal sustainability and growth prospects. Long run fiscal sustainability analysis shows that Slovenia will need to run surpluses and build up reserves to offset the future rise in age-related spending, in order to achieve a target debt to GDP ratio of 60 percent by 2050. Indeed, a fiscal adjustment of around 10 percent of GDP would be required to restore the intertemporal balance and each year of delay in adjustment will require additional adjustment by 1/8 percent of GDP to restore the balance, placing a significant debt burden for future generations. Voters in Slovenia, which held a presidential election last year, return to the polls on Sunday to choose members of the lower house of Parliament, the 90-seat National Assembly. Slovenia's National Electoral Commission has 2008 parliamentary election results in Slovene as well as English. In addition, a summary of nationwide results is available at the bottom of this posting, under Update. This posting deals exclusively with the upcoming parliamentary election; Slovenia's 2007 presidential election has an overview of developments prior to 2008 in the former Yugoslav republic. Save for two mandates set aside for Italian and Hungarian ethnic minorities, National Assembly seats are filled at the nationwide level by the largest average method of proportional representation (the d'Hondt rule) among parties polling at least four percent of the national vote. Voters may choose a party list or an individual candidate, and a complex procedure provides for the subsequent allocation of seats among eight multi-member constituencies (each comprising eleven seats, which are initially allocated by the Droop quota) and 88 single-member districts; nonetheless, due to the proportional nature of Slovenia's electoral system, some single-member districts end up with more than one deputy, while others get none. The two deputies representing the Italian and Hungarian minorities are chosen by simple majority preferential vote (the Borda count method); however, voters belonging to either minority group may also take part in the election for the remaining 88 seats. Slovenia has a Western European-style multi-party system, and coalition governments have ruled the country since the attainment of independence in 1991. Since the 2004 parliamentary election, a center-right coalition government headed by Prime Minister Janez Janša of the Slovenian Democratic Party (SDS), in alliance with the Democratic Pensioners' Party of Slovenia (DeSUS), the Slovenian People’s Party (SLS) and New Slovenia (NSi) has held office. Opinion polls indicate SDS is likely to remain Slovenia's largest party, narrowly ahead of the left-wing, opposition Social Democrats (SD), led by Borut Pahor. The Social Democrats had finished in third place in the 2004 election, well behind SDS and the left-of-center Liberal Democracy of Slovenia (LDS), which ruled the country almost uninterruptedly from 1992 to 2004. However, LDS suffered a damaging split in 2007, when several of its deputies left the party to establish Zares (For Real). In addition, a number of leading LDS figures jumped ship to join SD, which appears poised to emerge as the main left-of-center party, well ahead of Zares and a much-diminished LDS. Although the Social Democrats were originally a post-Communist party, they favor the sale of state-owned enterprises, albeit in a more limited fashion and at a slower pace than SDS. Meanwhile, the nationalist Slovenian National Party (SNS), which stands to the right of the government, expects to build upon its strong showing in last year's presidential election. However, SNS could lose support to Lipa, a breakaway populist party established by earlier this year by three former SNS deputies. Although inflation has been at times the highest in the Euro zone - Slovenia adopted the Euro as its currency in 2007 - the country's economy has otherwise performed well under Janša's tenure, registering solid growth, the lowest unemployment rate since independence and - according to government statistics (but not those of the EU or the IMF) - a budget surplus. However, the election campaign has been dominated since the beginning of this month by allegations that Finnish weapons manufacturer Patria bribed Janša to secure a contract to supply armored personnel carriers to the Slovenian army in 2006. Janša has denied any wrongdoing, but Finnish investigators are probing the allegations, which were originally reported by Finland's state broadcaster YLE. The scandal has soured relations between Slovenia and Finland (which owns a majority stake in Patria), but it does not appear to have had an impact on the election race back in Slovenia, at least according to the last polls published a week before the event (polls may not be released during the last week of campaigning). However, SDS is unlikely to secure an overall majority, and some polls suggest that two of Janša's allies, SLS and NSi may fall below the four percent threshold and lose all their seats in the National Assembly, which would further complicate the premier's re-election prospects. At least six parties - SDS, SD, Zares, DeSUS, LDS and SNS - are expected to win parliamentary representation in Sunday's vote, and it remains unclear what kind of government would emerge should the center-right parties lose their overall majority. The election had a 62.3% voter turnout rate, slightly up from 60.6% in 2004. 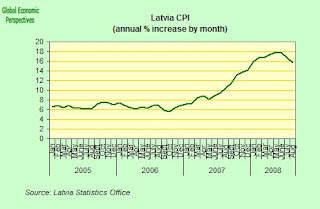 The annual rate of increase in Latvian consumer prices was 15.7% in August 2008. Month on month the situation did imporve slightly, since prices decreased by 0.4% when compared with July. The average price of goods decreased by 0.9%, but the price of services continued to increase, and were up by 0.7%. Prices of vegetables and fuel fell, but the price of clothing, catering and rent were all up. Thus while the trend is for annual inflation to moderate, the news is far from unambiguous, with widespread secondary price shocks continuing to make their impact felt. Food prices were down - by 2.2% - but this was mainly influenced by seasonal decreases in the price of fruit and vegetables and fruit. Bread, dairy products and cheese prices also fell. Fuel prices were down by 4.3%, as were motor vehicle prices. The widespread presence of discounts meant that the prices of non-durable household goods, individual care goods, bicycles, sports and recreational equipment all decreased. Purchase of new cars became cheaper, as did the prices of data processing equipment, airline tickets, furniture and furnishings, carpets and floor coverings diminished. 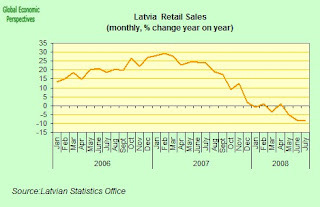 Latvian retail sales we should remember were down again in July, both on June 2008 and on July 2007. 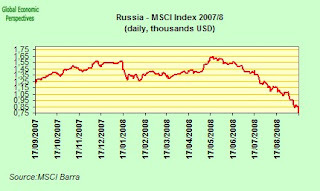 Compared to July 2007, the seasonally and working day adusted constant price index was down by 8.5%. The largest volume decrease was in non-food products group which were down by 9.4%. 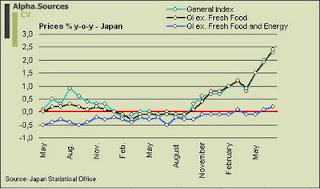 There was a slighly smaller decrease in food products, which were down by 6%. The only increases were in mail order business – up by 7.2% and in retail trade in pharmaceutical and medical goods – up by 3.2%. In the face of such a decline in demand the more competition driven sectors have little alternative but to lower their prices. On the other hand, prices in the non competition driven sectors continued to rise, and rent in municipal flats and houses, the cost of refuse collection and other publicly administered services were up, as were liquefied gas prices. Alcoholic beverages, cereal products, meat and meat products, fish and fish products, eggs, oils and fats, sugar, sweets and non-alcoholic beverages all went up, as did clothes, textiles, household goods, and school textbooks. 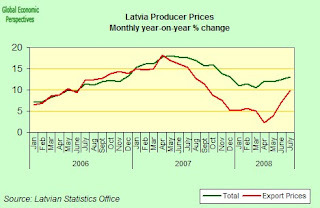 Latvian industrial producer prices rose in August at a 13.1% annual rate, up frm the 12.4% annual rate registered in July. Month on month producer prices increased by 0.9%. On an annual basis it has been the increase in the cost of energy components like electricity and gas, and the price of manufactured food products and beverages which have made the biggest impact on the overall level of producer prices,contributing 4.5 and 4.1 percentage points, respectively. 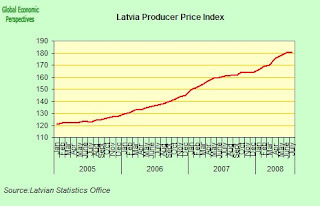 As can be seen in the chart below, Latvian producer prices are now up over 50% on the start of 2005, and with the Lat effectively tied in value to the euro (which is either used by, or a reference point for, nearly all Latvia's major external customers) this represents a huge loss of competitiveness for Latvian industry and service companies. In terms of the outlook for Latvian inflation moving forward we need to think about just when it will be that year on year crude oil turn negative, and when this does happen, what will this mean for Latvian inflation? An interesting question this one since it will really show us the "naked truth" about how resistant Latvian prices are to correcting themselves as the economy continues to languish in recession. 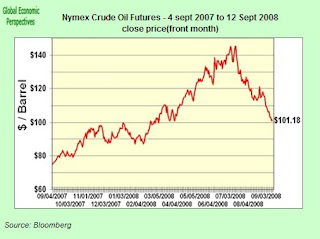 Oil prices have fallen substantially recently, even if with considerable volatility in the process. Last Friday, for example, , the first time oil had closed at over $100 in more than a week. Oil prices in fact shot up by more than $6 a barrel on Friday, with light, sweet crude for October delivery rising $6.67 to settle at $104.55 a barrel on the New York Mercantile Exchange, after earlier rising as high as $105.25. The increase followed the announcement of the sweeping US government financial rescue plan which emboldened investors to re-enter equiity and commodity the markets. Crude thus climbed over $13 in the space of three days, but prices will more than likely resume their downward trend, at least in the short term, since demand for energy is likely to remain weak as the economic slowdown continues to bite in the US, Europe and Japan, while key emerging markets maintain tight monetary policy (although not Latvia unfortunately, since the Lat peg means there is no monetary policy to implement) in the battle to contain inflation (I am talking here of countries like Brazil and India). So, despite the coming and going, the trend in oil is decidedly down, and crude has now fallen around $43 — or over 30 percent — from its all-time trading record of $147.27 reached July 11. So we are now hitting prices which were reached on the way up in the middle of February, but how long will it be before we are below the same price y-o-y? 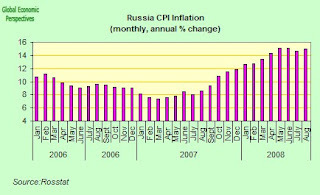 Then annual inflation rates will start to notice what is called the "high base effect", and it will be interesting to examine the precise differences between those countries where secondary effects have made their presence felt (like Latvia unfortunately), and those where core inflation has basically remained low. At the same time Latvian wages, and despite the recessionary backdrop, continue their steady upward march, at a rate which is well above consumer price inflation plus productivity. 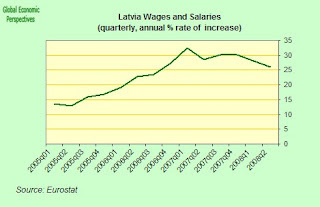 Compared to the second quarter of 2007, gross hourly wages in Latvia were up by 26.1%, according to the most recent data from the Central Statistical Bureau. The statistics office noted that the seasonally adjusted rate of increase has been reducing since 4th quarter of 2007, but this is very small consolation for a process that is effectively blowing a massive hole in the side of the Latvian economy's ability to compete internationally. And indeed they also point out that compared to the second quarter of 2007 the most rapid increases in hourly labour costs have been in economic activities like education – up 30.5%, hotels and restaurants – up 29.3%, mining and quarrying – up 27.7%, construction – up 27.4%, and trade – up 27.3%. On the other hand unemplyment has started to rise, slightly, and according to the labour board there were 56333 people unemployed in August - nudging up the unemployment rate to 5.2%. To put things in perspective, the number of unemployed is still below that registered in August 2007 (57940), when the economy was, to all appearances, still booming. Employment, on the other hand, has been more or less stagnant over the last 3 quarters, although year on year rates of employment increase have been healthy (an average of 4% during the last three quarters) and total emplyment has not started to decline in any notable form. 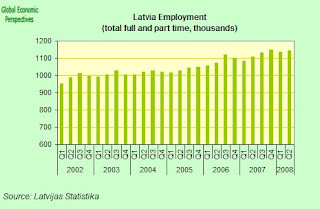 Internal demand, as we have noted, has collapsed, and the Latvian economy is in recession. So what is the answer to this mystery? How can employment be stable, real wages rising considerably, and yet the economy slumping. Well, the answer isn't too difficult to find, it revolves around household borrowing, and the rate of increase in household debt. If we look at the chart below, we can see that the Latvian "boom" was being fuelled by truly massive y-o-y rates of increase in household borrowing. So the high rates of growth were not due to large productivity gains pushing a supply side expansion, but due to rapid increases in domestic consumption fuelled by growing debt, a process which pushed the Latvian labour market (given Latvia's unusual demography) way beyond capacity limits, and stocked-up a huge inflation bonfire. 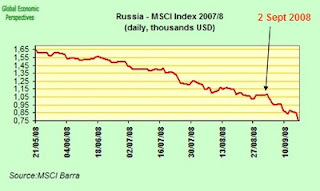 As we can see in the above chart, this all really became "one big party" after mid 2005. 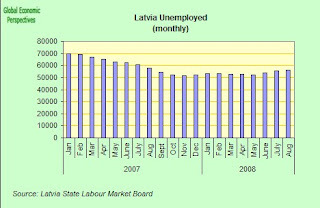 Now I say Latvia has no available monetary policy, but this isn't entirely the case. 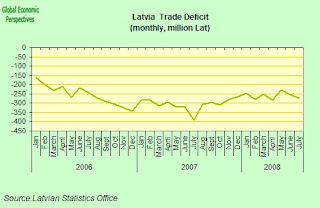 Had the Latvian central bank imposed very strict credit restrictions starting in 2005 (and not in the spring of 2007), and had the Latvian government operated a large (liquidity and demand draining) fiscal surplus of 5% of GDP or so starting in 2005, then maybe much of the worst of the distress which is now about to come could have been avoided. But it is always easy to be right after the event, and I am not claiming to have had any better idea than anyone else at that point. Certainly even the IMF staff economists (who seem to me to be normally much more on the ball than their Brussels and Frankfurt equivalents) only started pushing the idea of fiscal surpluses strongly rather late in the day, and I am sure if we could rerun all this they would have acted differently. But then, you know, the owl minerva only flies after dusk, and all that. But, as we can see, once the credit restrictions were put in place to some extent, the rate of increase in new credit did slow, and what is so remarkable is how quickly the whole economy itself slowed as this increase in credit lost steam. We are still seeing a year on year rate of increase in household credit of around 25%, and yet the economy is contracting, so what happens if credit stops growing is anyone's guess. So what is the future? Well basically, given what we have just seen about the debt side of the equation, I think we can safely say you can forget about Latvian domestic demand as a driver of growth. And since government spending is not going to be the answer given the impending liabilities which will be hitting the Latvian state from the ageing population phenomenon (health, pension costs etc), exports would seem to be the only way out. But this is where, after all that inflation, we hit a snag. 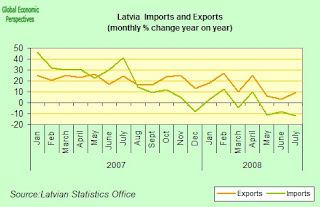 As can be seen in the chart below, Latvian exports, far from having risen to the role which falls upon them, have rather weakened over the last six months or so. 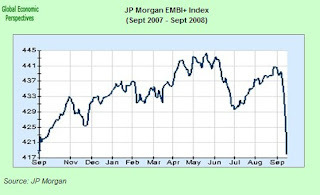 True, in year on year terms, they have been rising, but the rate of increase has been slowing steadily, even if - due largely I think to an especially weak month in June and a low base effect in July 2007 - they did rebound a bit in July. The weakness in Latvian exports as a growth driver has been rather masked by the much more dramatic decline in imports, which have moved strongly into negative y-o-y territory despite the high level of oil costs, and this has obviouly been a headline GDP growth positive (that is GDP would have been worse had imports not shrunk so considerably). The decline in imports has also prevented the trade deficit from deteriorating further. But of course, if exports are now to drive growth (and if Latvians are to start paying back all that foreign debt they have been accumulating) then what is needed is a surplus not a deficit. Well, Latvia needs to start selling more abroad, whatever, however, and I think that in order to do this, Latvian relative prices now need a very substantial adjustment, which either means very substantial internal price deflation, or that horrible and unmentionable "D" word. If people sit back with their arms folded and simply wait to see what happens (out of idle curiousity, perhaps? ), then the former will inevitably happen, but the thing is the process could become so violent that it provokes the second inevitably in its wake, which raises the question as to whether it might not be better in the longer run to grasp the bull by the horns, and go down the second road now and dircetly. Whatever happens, none of the possible solutions for the current predicament are going to be easy. With the central banks benchmark interest rate currently standing at 11%, and inflation at 15%, Russia has negative interest rates of 4% which obviously make it very easy to fuel a lending driven consumer and construction boom, but very much more difficult to communicate to observers that you actually know what you are doing. 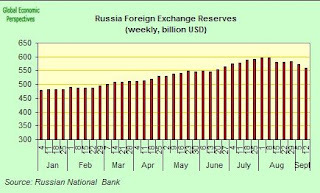 So while all that foreign exchange reserves muscle that the central bank can put to work in the short term to stamp out the present bonfire will in all probability bring a halt to the present panic, they are clearly not able to prevent the outbreak of the fires in the first place, and we should, therefore, expect more of the same at some point. To make a comparison, Brazil's central bank currently has interest rates at 13.75% while inflation is running at just over 6% (ie Brazil has 7.5% positive interest rates), and the bank is currently justifiably earning for itself a reputation as Latin America's new Bundesbank, an expression I doubt it would ever ocur to anyone to use in reference to the Russian equivalent. And the comparison I am making with Brazil is no idle one, since Brazil is, of course, also an oil-and-resource rich emerging economy. 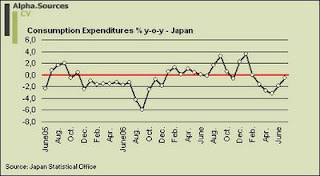 It has been a while since I last had Japan under the spotlight where and where I noted that Japan almost certainly would be tumbling into or very close to recession. 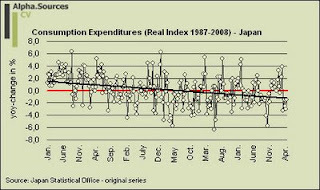 Since then, data have been pointing only one way really and with the recent downward revision of an already quite awful Q2 GDP reading Japan now seems certain to be flirting with a recession. As per usual, I will peruse the most recent pile of data but now that Japan stands on the brink of yet another recession in the 21st century, I also think that it also finds itself confronted with a crucial question. What will happen to spending and the political situation in the wake of Fukuda’s resignation? I am no political specialists, but I will try to highlight the issue from an economic view point all the same. As if the initial Q2 GDP reading was not tough enough clocking in at -2.4% y-o-y the revised figure released by the cabinet office of -3.0% suggests that Japan’s economy took a significant beating in Q2. On a quarterly basis Japan’s economy thus pulled the rather dubious trick of completely erasing Q1 0.7% growth rate meaning that growth in H01 2008 stands at 0% q-o-q. The corresponding figure for annual values is -0.2%. Given the sharpness of the contraction it should not surprise many that almost all components of GDP were down. Most important perhaps were net exports which failed to make a positive contribution for the first time in three years. Especially domestic demand and investment weighed heavily on the head line figure and without neither government spending nor, more importantly, exports with net exports contributing -0.1% this is the figure you get. In general, Japan seems to be caught in somewhat of a vicious circle at the moment. With domestic demand congenitally weak and foreign demand now faltering corporate capex seems certain to fall back. Add to this, a decline in terms of trade due to the increase in imported goods prices as well as a fiscally strained government and you end up with a busted ship as they say in the sci-fi shows. If we turn our attention to prices it seems that Japan got that last spurt of headline inflation pressure in July with all three indices posting positive rates. 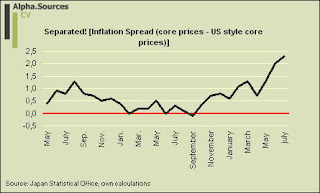 The general inflation index rose 2.3% from a year earlier, but more importantly the US style core-of-core index managed to eek out a full 0.2% print. This brings the average, for this index in 2008, to 0% y-o-y. It is the first time since August 1997 that the core-of-core index posts such a gain. Clearly, and since the increase in inflation comes at a time when the economy is actually shrinking to the tune noted above, this is all about cost push inflation. The deterioration in Japan’s terms of trade represents an important underlying current here since Japan, for the most part, imports energy and food related produces. In so far as goes the domestic value chain inflation has only scarcely found its way to the market in terms of the core-of-core index, a point I have emphasized in my analysis before. Given the rather violent setback of global headline inflation so far in H02 2008 and the imminent outlook of oil dropping to negative growth rates y-o-y towards Q4 Japanese consumers should once again find some solace, if only a little bit, at the pumps and in the supermarket as we move towards the end of the year. Of course, this will probably mean that Japan slips back into deflation in the core of core index, but it is important to understand that this seems to be the rule rather than the exception. A further breakdown of domestic demand shows us that household consumption expenditures have contracted in every month so far in 2008. Even if the rate of contraction seems to be edging in the right direction, it still indicates that Japan has been hit extraordinarily hard by the recent bout of global stagflation. Japanese consumers once again cut back on fuel and food expenditures while spikes in expenditures on furniture and clothing kept the index from plummeting completely. A worrying trend in the context of domestic consumer demand is furthermore that household income and wages have almost fallen off a cliff in recent months. Total cash earnings fell back 2.5% in July and household income was down 3.5% on the year. In light of this, it is difficult to expect the Japanese consumer to be able to muster that much debated second bulwark against recession once foreign demand trends down. As for corporate sector the overall headline news was actually a rare bright spot as industrial production climbed 0.9% in July from June where it fell 2.2%. While certainly down on an annual basis, industrial production still seems to be increasing at levels higher than those seen throughout 2006 and H01 2007. The news from the small services on the ground, in the form of Japanese small merchants, consequently point towards a further deterioration. This is no doubt strongly related to the slump in consumer confidence and spending and shows the extent to which the slowdown in demand is affecting businesses that are dependent on the home market alone. It is also difficult to see much upside in the July number given the slew of other incoming data. As such, the overall gauges for fixed capital formation in Q2 points towards a sharp de-acceleration of activity and one really finds it difficult to conclude much else than the fact that Japan is now in a recession. According to Morgan Stanley’s Takehiro Sato one mitigating factor here may be the relative tight management of inventories by Japanese companies in recent years. The point here would be that since Japanese companies do not have a large backload of inventories to scale down, headline production may not have to slump completely. Sato remains skeptical of this analysis and I agree. Clearly, the inventory related argument ultimately depends on the actual rate and severity of the incoming slowdown not least in Japan’s main export markets. It is clear to me that any sharp slowdown signals from China would mean for Japanese corporate capex to see a significant period of downscaling. In fact, with all external deficit economies slowing down sharply, it is difficult to have much faith in the inventory argument. The point here is simply that the level of industrial activity that the domestic sector can support in light of falling external demand may be much lower than many expect. In this context and while exports continued to de-couple from the US in July imports also rose at record pace. The resulting narrowing of the trade surplus to an almost even balance is exactly what is robbing Japan from part of its growth engine. 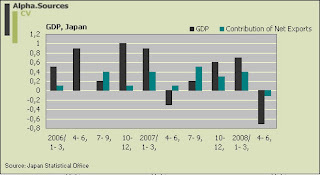 Clearly, and if the terms of trade are set to improve it could be all back to normal for Japan in H02 2009. 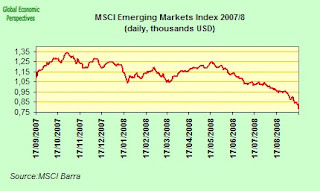 However, it seems anything but certain that a correction is also coming in terms of emerging markets even if it will be relatively short lived. On that note, net exports and foreign asset income will be less of a driving force for growth in the latter part of 2008. What is more, Japan also seems to be sporting its very own miniature residential investment crisis as bankruptcies amongst construction and real estate companies continued to climb to alarmingly high levels in August. Sato digs deeper into this issue and directs attention to the point that one of the main risks facing Japan is that credit dries up leaving even more companies without the possibility to carry on their operations. This tune is well known and has credit crunch written all over it. According to Sato, one of the main risks at the moment is consequently that the sharp contraction of credit and activity in the real estate sector could spread to other sectors. One key development to gauge here would be the trend in overall corporate bankruptcies, especially over the course of H02 2008. The probability and discussion of fiscal stimulus to revive Japan’s economy got significantly more clouded with the recent decision of Prime Minister Fukuda to step down. The decision itself was not entirely unexpected as the PM, and his cabinet, has had a distinctly hard time getting their will through parliament, as the opposition controlled the lower house. According to Ken Worsley, Fukuda’s resignation is thus a part of a more fundamental strategy to install a special session in the Diet which allows the ruling party (the LDP) to pass a number of bills. In the middle of all this there is a 2 trillion yen ($18 billion) expansive fiscal deal on the table. If the economy continues to deteriorate one would think that such a deal could be relatively swiftly passed by both chambers of the parliament. With mounting rumors of a general election in November, the current situation looks pretty unpredictable. . As with the impending and much debated consumption tax to widen the budget’s revenue base it seems that priorities in the political system are not yet straight when it comes to moving forwards, or backwards, on the fiscal front. As could have been expected the candidates to replace Fukuda are rounding up and while I know way too little about Japanese politics to say anything about the individual contenders, it is clear that one issue high on the agenda will be what they intend to do with respect to the fiscal lever and by derivative the much debated reform ghost in Japanese politics. In this connection recent comments from various candidates reveal somewhat of a disagreement. Obviously, the difficulty with which Japan can actually use fiscal policy, saddled with a debt/GDP ratio of +180%, is not new. The outgoing PM consequently stated the following rather incredible claim a few months ago (quoted by Bloomberg). There is nothing to be done but wait for export markets to recover. I do find this rather interesting not least because it comes from, at the time, a leader of a country and an economy. Essentially, I agree with Fukuda though. It is very unlikely that Japan will be able to ignite domestic demand to a degree which will make the incoming slowdown milder. This is the nature of export dependency as a result of an ageing economy. However, the sentiment expressed also highlights, I think, a more profound perspective with respect to Japan’s policy makers’ relentless strides to rebalance the economy. Basically, Japan is now set on a growth path which no immediate policy can change. Anything short of a very local Japanese version of the IT induced positive productivity shock  would not do the trick, so there is, in fact, not much to be done. Of course, the sentiment turns almost delusional with comments quoted from Hiroaki Muto senior economist at Sumitomo Mitsui Asset Management Co. in Tokyo. Japan's economy is weak because foreign demand is slumping and the terms of trade have been worsening, not because there are any big domestic structural problems. I would grant Mr. Muto some of his argument in the sense that the specific deterioration in the terms of trade, this time around, has made matters worse. However, it is precisely because Japan has domestic structural problems that she is export dependent, and therefore it also because of domestic structural issues that Japan’s economy finds itself in a weak position when foreign demand falters. So alongside this new system created to ease funding problems, the new economic package also brings a wider range of safety net guarantees of different types. Safety net guarantees lie outside the shared responsibility system, and have been used, as the name says, to provide a safety net for the SMEs that cannot access CGC-backed loans. Originally, about 70 sectors were designated as eligible for credit support based on criteria such as sales performance, but the number has almost doubled in the wake of the errant policy-induced housing shock that followed last year’s revision of the Building Standards Law. The eligibility of a debtor is decided by the external criterion of whether it is included in the specified industries and whether sales are down more than 5%Y for the latest three months, but the number of industries covered could rise as the recession deepens. If the economy continues to deteriorate one would think that such a deal could be relatively swiftly passed by both chambers of the parliament. However, this seems far from certain with in light of the political limbo in which Japan now finds itself. As with the impending and much debated consumption tax to widen the budget’s revenue base it seems that priorities in the political system are not yet straight when it comes to moving forwards, or backwards, on the fiscal front. More importantly, Sato also muses on the potential for the Japanese government to pull of the extra emergency provisions without having to issue more paper. I can see the argument in the sense that the government would only have to fork over its part of the cash if the debtor went belly up. In a general perspective however, any kind of slack in terms of loosening fiscal policy, which really only could be financed through the issue of government bonds, would certainly bring forth the rating agencies. Especially, any de-facto abandonment of the objective to balance the budget by 2011 would not be taken lightly  . In any case, and as Sato also explains in some detail, it is not at all certain that fiscal stimulus would help boost the economy but merely shift liabilities from companies and the consumer over to the government. The key argument here is one of Ricardian Equivalence where by economic agents adjust their expectations so as to negate the initial effect from the fiscal windfall. Obviously, the shift in liabilities themselves would not be without advantage since the increased savings by households and companies would likely bring the overall discounted value of Japan’s liabilities down. In essence though, this remains a very theoretical argument and should not distract us from the point that Japan is slowly but sure trending towards an end point when it comes to its public balances. At some point she simply won’t be able to pay and the international institutional set-up (rating agencies) and policy makers (G8 anyone) would be wise to think in alternative solutions here. The alternative in terms of some ageing countries’ abilities to fund their ongoing liabilities will not be pretty at all. Moreover, if we take Sato’s argument to the extreme the theoretical future discounted value of Japan’s government debt could be made equal to the equivalent future discounted value of the entire stock of company and household savings. However, this is not the way it is likely to materialize. As such and while I agree with Sato’s initial point that increased savings through deposits are likely to be channeled into cheap government funding, we also know that Japan’s savings are increasingly flowing out towards higher returns. Furthermore, this is a story with both a short term and a long term perspective, where the former is epitomized in Ms. Watanabe and her carry trading efforts and the latter by portfolio and investment outflows. As such, and given the current levels of Japan’s public debt ratio the theoretical process of funneling domestic savings into government bonds may not correspond to practice. I would hold this to be particularly doubtful in light of the fact that the income earned on foreign holdings of stocks and bonds are precisely what drive top line growth in Japan together with goods and services exports. Now that everybody seems to agree that Japan is in a recession the focus has naturally turned towards the question of just how it will look. V(W)-shaped, U-shaped or perhaps even L-shaped are all potential scenarios at this point. Official authorities in Japan in the form of the BOJ and the Cabinet Office maintain that this will be a quick recession. The analytical landscape is less convinced though. Takehiro Sato seems to be leaning towards a somewhat nastier scenario. As I have highlighted above, a sharp emerging market correction in China would definitely be catastrophic for Japan. Also Mary Stokes from RGE sees considerable downside risk to Japan’s situation. I tend to go for the more pessimistic of the narratives noted above. I also concur though that if headline inflation is set to decline as briskly as seems the case, it could just bring the relief Japan needs if she is not to falter completely. In the end however, external demand and asset income will, as ever, be crucial parameters to watch. This ultimately also means that Japan will suffer at the whims of the global economy. On that note, I see considerable upside in places such as Turkey, Brazil, and India. Japan’s savers would be wise to expose themselves towards these regions in the future in their attempt to hold the most efficient global portfolio. Many great unknowns present themselves though. China’s development is crucial for the global economy, but also the potentially incoming train wreck in Eastern Europe and the instability in Russia could be one of those famous trigger points. Conclusively, I see Japan limping ahead for the remainder of 2008 where foreign demand, all things equal, will be less of a driving force than hitherto. Given the rate of technology adoption and diffusion across economies today, it is very difficult to see how Japan would be able to sustain a relative competitive advantage in any sense of the word. Personally, I think that this is very unlikely to materialize in the first place, but as in other, more fundamental parts of life, commitments matter. I am assuming here that the government can finance its budget deficit more cheaply than individual consumers and companies. Is India Riding Out The Storm? Have We Already Seen "Peak" Italian Retail Sales?